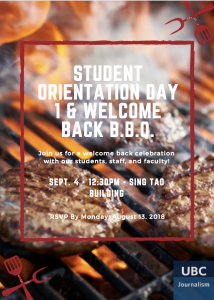 Join us on September 4th for our annual UBC Journalism School Day 1 Orientation and Welcome Back Barbecue. The event will take place in Room 104 at 6388 Crescent Road (School of Journalism) from 9:30 a.m.-11:30am (BBQ at 12:30pm) on Tuesday, September 4th, 2018. Please RSVP on our event page.